The Cisco® IP Phone 6800 Series is a cost-effective, high-fidelity voice communications portfolio designed to improve your organization’s person-to-person communications while reducing your operating costs on approved Unified- Communications-as-a-Service (UCaaS) platforms. The 6800 Series combines an attractive, new ergonomic design with “always-on” reliability and secure encrypted communications. The phones deliver advanced IP telephony features and wideband audio capabilities with an easy-to-use, full-featured voice communications experience. Only the 6851 supports the Key Expansion Module (KEM). The line buttons on each model are fully programmable. You can set up line buttons to support either SIP registrations, or call features, such as speed dialing. You can also boost productivity by handling multiple calls for each SIP registration, using the multiple-calls-per-line appearance feature. Tricolor LEDs on the line buttons support the calling features and make the phone simple to use. 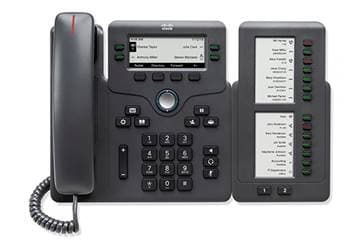 Fixed function buttons on the 6800 series phones give you one-touch access to service, messaging, directory, hold/resume, transfer, and conference features. A full-duplex speakerphone lets you set up clear multiparty conferences for flexible, productive collaboration. There are fewer fixed function buttons available on the 6821 than on the 6841 and 6851 (see Table 1 for details). The Cisco IP Phone 6800 Series maintains the same usability standards and standards for a context-sensitive user experience as the Cisco IP Phone 7800 Series. The 6821 IP phone has a 2.5-inch (240×120-pixel) grayscale display with white backlighting for easy reading. The 6841 and 6851 IP phones each have a high-resolution 3.5-inch (396×162-pixel) grayscale display with white backlighting. Localized language support is available for global users. See Table 6 for a list of available languages. The 6800 Series is also energy-efficient and eco-friendly, to support green initiatives. The 6821 and 6851 support Power over Ethernet (PoE) Class 2. The 6821, 6841, and 6851 are Energy Star certified. The 6841 and 6851 support a power-save option that reduces power consumption during off-hours, saving costs by increasing energy efficiency. The 6800 Series is ideal for businesses that want to update their phone systems from traditional analog or digital-based systems to an IP communications system with supported multiplatform call control systems. The Cisco IP Phone 6800 Key Expansion Module (KEM) extends the capabilities of the Cisco IP Phone 6851 with additional buttons. This module adds 14 physical buttons along with access to 14 additional buttons via the page buttons, for a total of 28 additional buttons. The KEM supports the Programmable Line Key (PLK) function, but does not support any SIP registrations. Calls may be monitored and answered using the PLK function, but calls may not initiated from the KEM. The 6851 IP phone supports one KEM only. The 6800 KEM comes with a foot stand and cable to connect it directly to the base device in a traditional side-by-side configuration (Figure 2). Table 1 lists the features and benefits of the Cisco IP Phone 6800 Series. ● An easy-to-use interface that provides a traditional telephony-like user experience. ● 6821: White backlit, grayscale, 2.5-in. (6.4-cm) 240 x 120-pixel display. ● 6841 and 6851: White backlit, grayscale, 3.5-in. (9-cm) 396 x 162-pixel display. ● Scrollable access to calling features and text-based XML applications. ● 6821: Narrowband audio handset connected through an RJ-9 port. ● 6841 and 6851: Ship with a narrowband audio handset connected through an RJ-9 port. An optional wideband audio handset is sold separately for these models only. ● All 6800 series handsets are Hearing-Aid-Compatible (HAC) and meet Federal Communications Commission (FCC) loudness requirements for the Americans with Disabilities Act (ADA). You can meet Section 508 loudness requirements by using industry-standard inline handset amplifiers such as Walker Equipment W-10 or CE-100 amplifiers. The dial pad on all 6800 series models is also ADA-compliant. ● The 6800 series handsets produce a magnetic field that attracts small metallic objects such as pins and staples. To avoid possible injuries, do not keep small metallic objects close to the handset. ● The analog headset jack is a wideband-capable RJ-9 audio port for the 6821, 6841, and 6851 models. ● 6821: Backlit line buttons and a message waiting indicator; uses icons on the LCD to indicate activation of the headset, mute, and select buttons. ● 6841 and 6851: Backlit indicators on the audio path buttons (handset, headset, and speakerphone), select, line, and message waiting buttons. ● A volume-control toggle provides easy decibel-level adjustments of the handset, monitor speaker, and ringer. ● A full-duplex speakerphone gives you flexibility in placing and receiving calls. For added security, the Audible Dual-Tone Multi-frequency (DTMF) tones are masked when the speakerphone mode is used. ● The foot stand holds the phone in a single position, making the display easy to view and the buttons easy to use while sitting down. You can remove the foot stand for wall mounting. There are mounting holes located on the back of the phone. ● 6821: Can be mounted directly to the wall using woodscrews and anchors for drywall. ● 6841 and 6851: Can be wall-mounted using the optional 6800 Series wall-mount kit (sold separately). ● 6851 only: Electronic hookswitch headset support via its auxiliary port. ● The 6821 and 6851 support IEEE 802.3af PoE (Class 2); power consumption does not exceed 6.49W. ● The 6841 supports wall power only through an included, regional power adapter. ● 6800 Series regional power adapters are available for powering the 6821, 6841, and 6851 when used in non-PoE deployments. ● The 6851 is compatible with the Cisco Unified IP Phone Power Injector (CP-PWR-INJ), and with the Cisco Aironet®Power Injector (AIR-PWRINJ5=). Table 2 lists the features and benefits of the Cisco IP Phone 6800 Key Expansion Module. Table 3 lists the features supported in the multiplatform phone firmware. Table 4 lists the platforms supported by the multiplatform phone firmware. 6821: Support with Centile is road mapped. Table 5 lists the session border controllers supported by the multiplatform phone firmware. All Cisco IP Phone 6800 Series models are covered by the Cisco End User License Agreement at https://www.cisco.com/go/eula. Table 6 lists the features and specifications of the Cisco IP Phone 6800 Series. ● 6821, 6851: Interoperable IEEE 802.3af PoE (Class 2) devices. 5V DC is required; they can be supplied locally at the desktop using one of the optional AC-to-DC country-specific power supplies (such as the CP-6800-PWR-NA= for North America). ● 6841: Must be powered with the supplied 5V DC country-specific power supply (such as the CP-6800-PWR-NA= for North America), which is included with the phone. ● 6800 Key Expansion Module: No local power supply. The KEM receives power from the attached 6851 IP phone. The attached 6851 IP phone may be powered via PoE or the 6800 (5V) power adapter. Table 7 gives ordering information for the phones and their accessories. 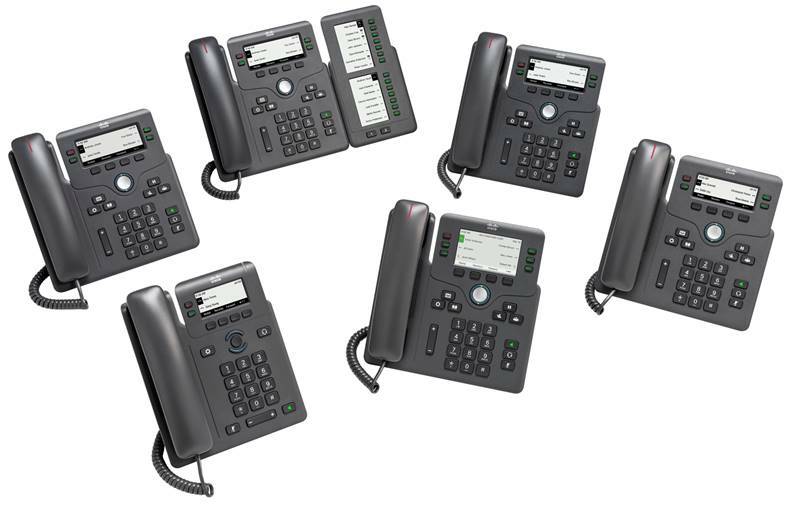 All of the 6800 MPP phones support Remote Configuration (RC). It is no longer necessary to order specific “RC” SKUs to use the RC function.